Sunday’s are typically the day when we sit down with our family and have a nice meal; around here, a nice roast chicken is typically the perfect Sunday dish. A roast chicken is basically a blank canvas, you can do whatever you want with it. If you’re in the mood for spicy, well make a nice spicy roast chicken with some cayenne pepper, if you want something aromatic how about stuffing some herbs underneath the skin? Literally, endless possibilities. Another important staple of any home cook’s inventory is a few foolproof dishes, that don’t require much thinking and are always fantastic. Something like a roasted chicken, covered in butter (can you say YUM! ), on top of whatever vegetables you have on hand. This is definitely a recipe for a foolproof roasted chicken, I bet my sister, the master of eggs and toast, could even make it! First let’s ready our dish, spread olive oil on bottom of roasting dish. Next chop onions and garlic, (and any other vegetables you may be using). Arrange the onions, 2 cloves of chopped garlic, and carrots at the bottom of the dish (we will be placing the chicken on top.) Leaving aside a few pieces of chopped onion, 2 cloves of chopped garlic and a couple baby carrots. (These will be used to stuff the chicken). Next, wash and dry your chicken, and place on top of the vegetables. Cover the chicken and vegetables with the juice of half a lemon, then place the lemon in with the vegetables. Stuff the chicken with the other half of the lemon, a couple and the vegetables you left out on the side, and one clove of the garlic. Use the last clove of chopped garlic and place the pieces behind the wings and legs of the chicken. Now the fun part! Brush the melted butter all over the chicken, and scatter the chopped pieces of cold butter in the vegetables, around the chicken and inside the chicken. Season both the chicken and vegetables with salt and pepper. Finally add in the water, and roast the chicken for an hour and a half. Basting every 30 minutes and turning the pan half way through to make sure both sides of the chicken brown evenly. Feel free to add in more water if you see the need. 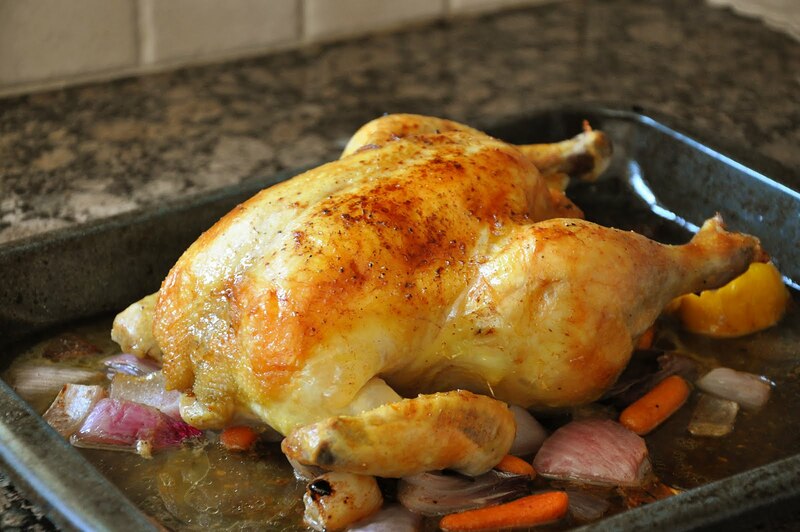 A simple, foolproof chicken, you can have this recipe done and in the oven in 15 minutes!